A few years ago I attended a workshop aimed at informing local accommodation providers what food they ought to feed mountain bikers that came to stay. Not being a B&B most of it didn’t apply to us but it was interesting all the same. One of the things that they talked about was that a drink of half CocaCola and half water would provide a boost for the last half of a ride – giving the rider sugar, caffeine, sodium and water plus replacing electrolytes lost in the first half of the ride. Today I spotted THIS article about the effects of CocaCola on the body and wondered whether the advice given was right or not. Have you ever tried the half Coke half water drink? 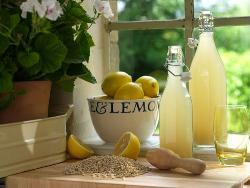 The other thing that I took away from the workshop was that REAL homemade lemon barley water is a great rehydrator. Here’s a recipe for those who want to try it for themselves. Let me know what you think. Bring the barley and 2 1/2 litres (4 1/4 pints) water to the boil, skin off any scum that rises and then simmer for 20 minutes. Draw off the heat. Pare the zest from the lemon into long strips using a potato peeler. Stir into the hot barley water with the caster sugar, then leave to cool. Strain and discard the barley and lemon zest. Stir the lemon juice into the liquid, taste and if necessary, sweeten with a little icing sugar, or extra lemon juice if it could do with a shot of acidity. You may even want to add a little more water to soften the flavour. Keep refrigerated, always serving your lemon barley water thoroughly chilled. Categories: General Comment, Have You Packed For Wales, Mountain Biking, One Big Adventure | Tags: #activities, #CocaCola, #lemonbarleywater, #recipe, #thirsty, #trailrunning, mtb, rehydration | Permalink. When is the butter added? Good question Cordelia. Can’t find any other lemon barley water recipe that uses butter.